The site known as the "Conway House" is a residential structure built circa 1807. The house is a well-preserved example of Federal-style architecture and sits on the banks of the Rappahannock River in Stafford County, Virginia. The site was the family home of author, clergyman, and abolitionist, Moncure Daniel Conway. The significance of the site to the Underground Railroad is its association with Moncure Conway (1832-1907) and thirty enslaved African Americans belonging to his family whom he helped to escape to freedom by accompanying them on their journey to Ohio. In his autobiography he recounts the escape and identifies one of the refugees as his nurse Maria. 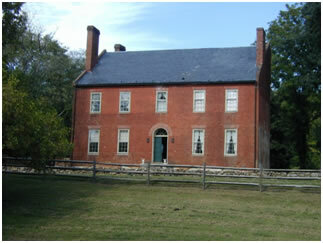 In 1838, Conway House was the home of Margaret Daniel and Walker Peyton Conway, an elite family with enslaved laborers. Walker Peyton Conway was a state legislator and a magistrate. Theirs was a family split by the Civil War. Two sons fought in the Confederacy but Moncure's mother and sister spent much of the war in Pennsylvania where the sister's husband taught. Among the five children, Moncure Daniel Conway came to feel that slavery was wrong. He attended the Methodist-sponsored Dickinson College in Pennsylvania and then studied law back in Virginia. After becoming a Methodist minister in Maryland, he was attracted to Unitarianism. Supported by other abolitionists, he graduated from Harvard Divinity School. In Boston he met an intellectual idol, Ralph Waldo Emerson. When he pastored churches in Washington, D.C., and Cincinnati, his anti-slavery sermons resulted in controversy. After leaving Washington, he found the Ohio congregation, however, more liberal and he was able to write and study. Conway had no freedom as long as others were enslaved. He satisfied his sincere desire to help others achieve their personal rights and liberties in July 1862 when he came upon the gathering of over 30 enslaved people from his parents' home, who had found their way to Georgetown. After making arrangements for military permission for transit and buying tickets, Conway led and accompanied them on a harrowing train ride through slave-holding Maryland to freedom and resettlement in Yellow Springs, Ohio. Today the descendants of families are known as the "Conway Colony." The Moncure Conway House is located at 305 King Street, Falmouth, VA. It is open for special events only.